See more information and photos of Heleni08. 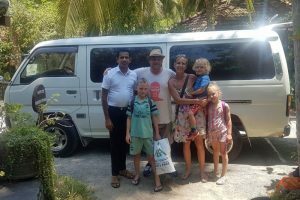 We are 2 adults travelling in August around Sri Lanka. Land Colombo airport Friday 17th Aug 15:45. Travel to Dambulla for 5 nights. Wednesday 22nd travel Dambulla to Pasikuda for 5 nights. Monday 27th travel from Pasikuda to Gal Oya National Park for 2 nights. Wednesday 29th travel from Gal Oya National Park to Kandy for 3 nights. Saturday 1st September train from Kandy to Colombo to fly home. Should we just get a driver for the first part of the trip (17th-22nd) as we don’t plan on doing much in Pasikuda other than relaxing and the lodge at Gal Oya said the location is very remote so I don’t see what other option we would have other than to book one way taxis? My only concern is will it be easy enough to book one way taxis for the second half of the trip? Any advice would be greatly appreciated. Thanks, Helen. See more information and photos of Fantasy Lanka Tours. Yes. Better to book a driver for first 6 days & last 4 days. Because you will need a driver during your stay in Kandy. You are correct. You can hire a vehicle 1st part of the tour and final part of the tour. Vehicle not required at your beach stay. When you are getting quote you can ask price for 2 legs separately or 1 quote for 2 legs.